Taco ’bout a fiesta! 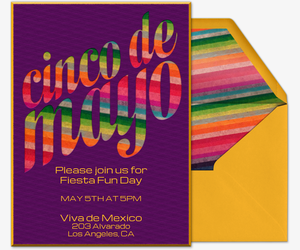 Celebrate Cinco de Mayo with Evite. Choose from dozens of free and Premium digital invitations to kick off the May 5th festivities celebrating the Mexican army’s victory against the French in the 1862 Battle of Puebla. 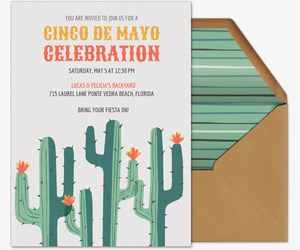 Whether you’re planning a phenomenal fiesta or just hitting the bars, round up your friends with one of our festive Cinco de Mayo party invitations. Parties are made easy with our invitation templates. Just fill in the blanks with your event details, then send out the invitation to your gang. Write a note in the custom host message box with any details you want guests to know, like if the party’s BYOB or if they can bring friends. Start the celebrations in a snap with free e-invites. 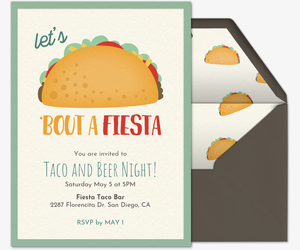 Our Cinco de Mayo collection features dozens of free online invitations for your May 5th outing. Prepare to party by sending out our free “Fiesta Like There’s No Mañana” invitation, or invite your crew out for tacos and tequila using our free “Cinco de Drinko” invitation. More of a margarita crowd? Opt for our “Cinco de Margaritas” invitation, featuring lots of limes. Or spotlight a fun picture of yourself or a favorite friend on one of our upload-your-own photo invitation templates. 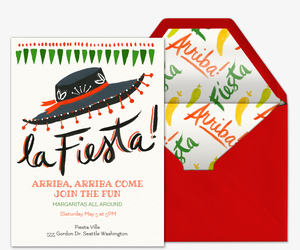 For an extra festive fiesta, go for a Premium Evite invitation. You can purchase our advertisement-free Premium Evite invitations and complementary envelopes for $12.99 for 15 guests, $24.99 for 50 guests and $49.99 for up to 750 invitations if it’s a fiesta for the whole family. Premium designs come with custom digital “stamps” and the option to insert additional photo or text cards. 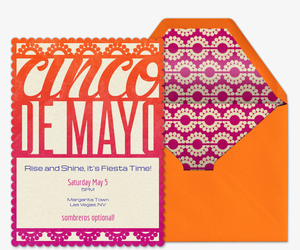 Our Premium Cinco de Mayo invitations flaunt bright and bold colors, sure to set the tone for a spirited celebration. 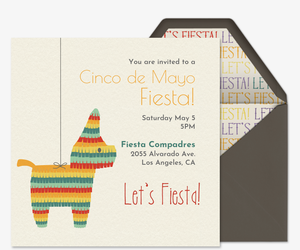 Choose from various colorful designs, such as our “Feliz Cinco de Mayo” invitation. Devoted to the decor? Select one of our designs featuring pretty papel picado. For a creative touch, you can also add a personal pic or set the entire design by using our upload-your-own or design-your-own invitation templates. Get fun fiesta tips from your friends at Evite Party Ideas. Check out our Cinco de Mayo Party Guide or our backyard fiesta party guide to cover all your party planning bases, from food and drink to decorations and activities. Then check out your favorite Mexican recipes to create a mouthwatering Cinco de Mayo menu, from the greatest guacamole and gluten-free green-chile queso dip to a build-your-own nacho bar. Or try something new with our three spins on the traditional taco. Don’t forget the drinks! Try your hand at our no-mixer margarita on the rocks, mezcal mule, red wine sangria or easy (and nonalcoholic) horchata. Finally, make Cinco de Mayo decorations the hit of your party with our DIY mini piñatas. Still stuck? Get inspiration from Cinco de Mayo real parties hosted by fellow Evite users, including a Cinco de Mayo 35th birthday party. ¡Ándale! Let’s party!